It was a slow night this week with only 9 attendees. It's been a long time since we've had single figures. Only two tables of games this time. A few people had turned up early to get an early start. Dan had had a birthday and had brought a bunch of new games with him. 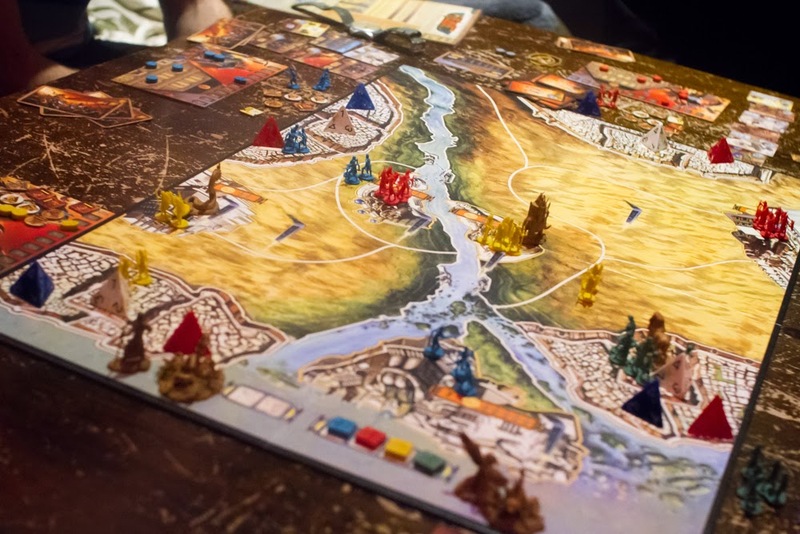 I arrived at 7:30 and a game of Kemet was being set up. They were playing the short game which is up to 8 points, but Steve managed to get all the way to 10 points on his final turn, the score needed for the long game, making him the victor. With Halloween approaching I started off with Betrayal at House on the Hill. It was Cathy's first game and she ended up being the betrayer. This can sometimes be a bit confusing if you've not played before but she managed well. She was controlling a poltergeist and we were attempting to exorcise her. Usually with Betrayal the build up lasts about half an hour and the game after the haunt is over quickly. 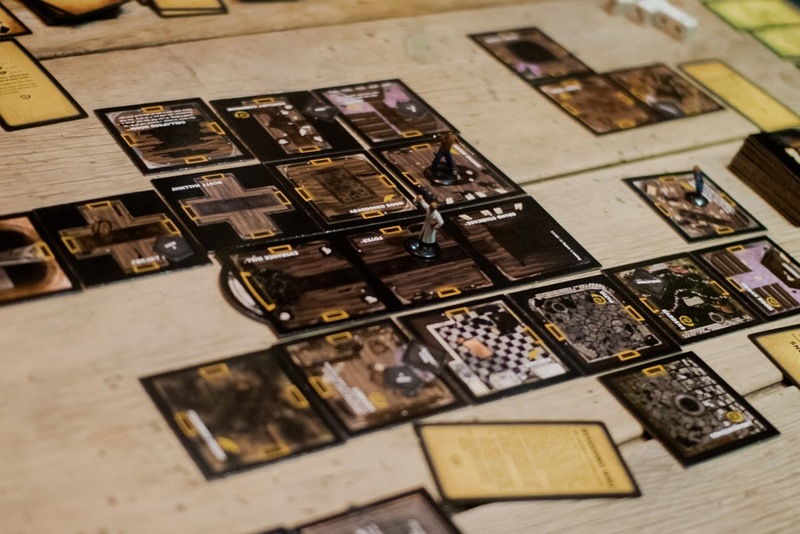 In this game the haunt dragged on a little and became a bit of a monotonous, dice rolling race but in the end good overcame, the ghost was exercised and the explorers all went home safely. Dan set up a game of Zeppelin Attack, another of his new games and I played a game of Five Tribes. I played it for the first time last week and really enjoyed it even though I did quite badly. It has a pretty unique mechanic that I've heard called worker displacement, which is a pretty nice pun. This time Alex scored a respectable 60 points for collecting the full set of cards. I thought he was onto a winner and he hastily placed his remaining camels to end the game. My strategy had been the same as last week, to get the most yellow guys but also to only put in low bids for turn order. This really boosted my score ending with over 60 points worth of coins. I ended up getting the top score so I came out liking this game even more than last week. In non board game related news Sam's made an IpBoG Steam group if people are that way inclined.